By the time the AAVSO was founded in 1911, there was already some thirty years’ worth of papers pertaining to variable star work accumulated at Harvard College Observatory (HCO). This was the product of HCO Director E. C. Pickering’s interest in variable stars, which began in the early 1880s. Most of these papers are now in the Harvard University Archive, but some remained in the hands of the AAVSO. By 1919 the AAVSO had its own office in the west wing of Building A on the grounds of HCO. There, for the next thirty-eight years, more letters, reports, and other material accumulated. When Margaret Mayall was named to succeed Campbell as Recorder in 1949, she added her own collection of papers from her years as a HCO staff astronomer, and she took up the task of overseeing the receipt and generation of more documents at AAVSO Headquarters. On October 5, 1953, the President and Fellows of Harvard College passed a resolution stating that variable star research is no longer as important as it was in 1931 (when the Pickering Memorial Endowment for variable star research was established), and that the income from the Pickering Endowment (which in part went towards the AAVSO Recorder’s salary) be devoted to “other astronomical research. Director Mayall and the AAVSO Council were warned a year earlier by HCO Director Donald H. Menzel that something like this would happen. And so—after a year of rumor, speculation, and discussion—this news was expected, but it was, nonetheless, shocking news. Director Mayall felt that there would be enough time to make careful plans to re-establish the AAVSO both as an organization and as a physical entity. But on December 8, 1953, HCO suddenly announced that Building A—housing AAVSO Headquarters—was to be demolished as part of an expansion program. 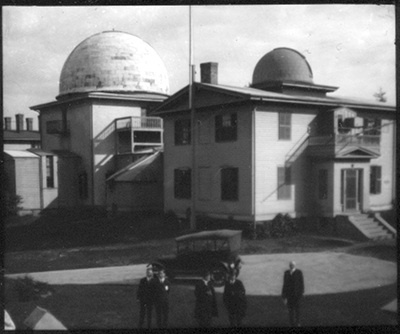 The AAVSO was told to vacate the premises by January 1, 1954. The move was made on January 2 by about a dozen AAVSO members and friends. When the surviving papers of sixty-eight years—from the Pickering, Campbell, and early Mayall eras—were moved away from HCO, they were taken-in by anyone who could offer a safe haven: Margaret Mayall and her administrative assistant Helen Stephansky each kept boxes of papers at home; Clinton B. Ford held onto the Secretary’s files; and the immediately-useful material was taken to the AAVSO’s newly-rented office at 4 Brattle Street—near Harvard Square—in Cambridge. Everyone involved did the best that they could under the circumstances to ensure the survival of the organization’s most important documents. However, due to the greatly reduced storage space at the new office, Margaret Mayall and Helen Stephansky spent many hours, day and night, sorting through the old files, keeping only what was important, and discarding the rest. The surviving files (with the exception of the Secretary’s files, which Ford kept at his residence until the early 1990s) were eventually reunited in 1965 at the next AAVSO Headquarters location at 187 Concord Avenue, Cambridge. They remained there during the remaining term of Mayall’s Directorship, and then from 1973—when Janet Mattei became the Director—through 1985. In late 1985 AAVSO packed-up once again—this time on a happier note—to move into its new headquarters at 25 Birch Street, also in Cambridge. The move gave Janet and her staff an opportunity to take their first good look in many years at these old papers. The process of packing up the office literally uncovered all of the old papers for a few moments, only for them to be returned to drawers and boxes once again at the new headquarters. As part of the 75th anniversary meeting of the AAVSO, held in August 1986 at the new Birch Street headquarters, Janet Mattei asked Michael Saladyga of the staff to set up a display of the AAVSO’s history in photographs, papers, and other items. This was one of the few times that such material was put on display as “from the AAVSO archives,” and it was certainly the largest—300 square feet—and most comprehensive exhibit of the AAVSO’s historical material ever. This was also the first up-close acquaintance that most of the meeting attendees had ever had with the AAVSO’s history. After the 1986 annual meeting, the displayed material was stored away in cabinets and boxes once again, to be mostly left alone for the next fourteen years. Janet Mattei was keenly aware of the value of the AAVSO’s archive: she referred to it whenever there was a need to clarify a discussion, or to cite a precedent or point of protocol for the organization’s operations. It was always Janet’s intention to organize the archive, but limited staff and budget, and many higher-priority projects kept this from happening. For example, the archival observations database project (1985–1997) was followed and overlapped by the Hands-On Astrophysics education project (1995–1998). Many other projects were being attended to at the same time, in addition to the daily database and office work. But at last, in 2000, three factors came together that would permit the start of the archives project: staff availability and interest; the approaching 100th anniversary of the AAVSO; and availability of funding through the Thomas and Anna Fay Williams matching grant.